MORE POWER TO YOU WITH NO DRAWBACK! Looking for more punch from the turbo in your turbo X5 or X6? This is the perfect upgrade for someone who wants a dramatic but safe boost in power - especially in the low to mid-range. Our software opens up the N55 engine's potential, delivering big gains in torque from idle all the way past 6500 RPM! The torque is especially improved after 2500 RPM, eliminating a pesky dead spot in the factory programming. This is a HUGE torque that is a NIGHT AND DAY difference! Our software is not just an increase in boost; we're not fooling the computer into making boost. This is a total re-write of the stock software, making power by adjusting the ignition and fuel mapping and boost. We have tuned for part throttle response as well as full-throttle with special attention given to ensure the correct, and safe, air-fuel ratio. Please keep in mind that with a "turbo car" it is "easy" to make horsepower by increasing boost BUT keeping your BMW reliable is the most important thing to Turner Motorsport. This software is a reflash of your computer. 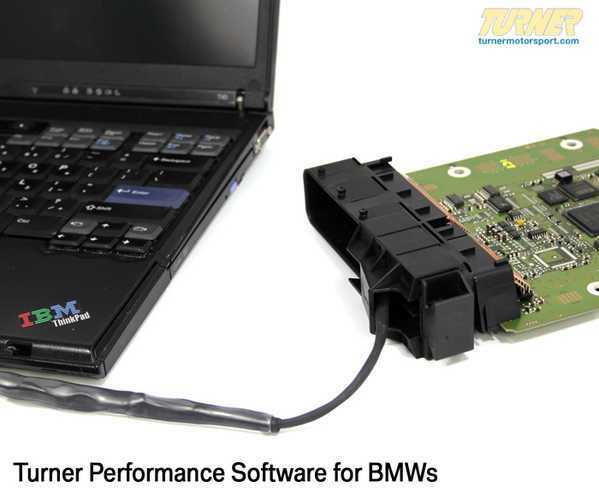 The computer will need to be sent to Turner Motorsport for the installation. Click here for specific instructions on shipping the computer. If you are unsure of how to ship your computer, we can provide you with a shipping packet. Return shipping is by UPS Ground but Express shipping is available.